Add and remove a fault to thrusters that colides into or triggers this GO. 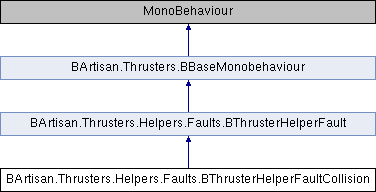 It is a component designed for 2D and 3D space, it implements all Collision* and Trigger* MonoBehaviour functions. Add the fault to all engines from the collider GO. See OnCollisionEnter in Unity docs for more info. Add the fault to all thrusters from the triggered GO. See OnTriggerEnter in Unity docs for more info. Remove the fault to all thrusters from the collider GO. See OnCollisionExit in Unity docs for more info. Remove the fault to all thrusters from the triggered GO. See OnTriggerExit in Unity docs for more info. Search for thrusters in the collider GO children too, less optimal. Each fault in your game must have an unique ID, so it can easily be identified. Automatically remove the fault after it was added. Ex: 3 for 3 seconds. Add this fault to the thruster(s). Remove this fault from the thruster(s).